There's always a certain time of year that you can see that your garden needs a big clean up, this may be trimming the bushes or getting a full spring clean done by professionals, whatever you choose, here are a few tips to a Garden Clean up. You need to make sure you use the right tools for the job, this could be the gloves you are using or the lawnmower might need to get checked up on before using it. A tool check is always needed when you are wanting to do a big clean up. If you are thinking of doing any planting or moving of plants, make sure you have a wheel barrow to help you move soil quickly. 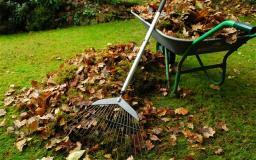 Sometimes people choose to rake and clean up their garden before they begin cutting and trimming, It is recommended to do the a brush up last, even though you want to make your garden neat, it has to get dirty first before you can start making it look aesthetic. Cut and trim as much as you can and shape your garden as you would like let the clippings fall and at the end sweep it all in one job and you will have the look that you are hoping for. These are every garderners worst nightmare, so the best thing to do is to get rid of them for good as soon as you find them. So dig them up and try pull all the way down to the root, then get weed prevention chemicals and put them in the area that you pulled the weeds from.